Join us at White Fields Community Church on December 24, 2018 at 4:30 or 6:00 PM for a special Christmas Eve service which will include Christmas music from our band and choir, as well as a reading of the Christmas story and a message about why Jesus’ birth is good news of great joy for all people. Invite someone to join you as well! Studies have shown that most people are willing to attend church on Christmas Eve if someone invites them, so consider yourself invited, and invite someone to join you and get Christmas started by focusing on Jesus! Someone needs to take 2016’s keys away, because it’s not acting normal. The Denver Broncos won the Super Bowl without an offense. Brexit happened. The Chicago Cubs won the World Series. And now Donald Trump just won the presidential election. What kind of bizarro world are we living in? Here in Boulder County, voters overwhelmingly voted Democrat. 71% voted for Hillary Clinton. The majority of the City of Longmont went for Hillary. Republicans took control of the House and Senate nationally, but Democratic candidates won almost every seat they ran for here in this area. Nationally, as of right now Hillary Clinton won the popular vote. Right before the election 61% of people said that they considered Donald Trump unfit to hold the office of president, which means that most people in our country are deeply concerned with the results, including some of the people who voted for Trump themselves. For Christians, no matter what your political stance, I think we must avoid the “us and them” mentality. Such a mentality encourages people to make value judgments about other people which are often not fair, such as “Liberals think that __________” or “Trump supporters condone __________.” Those generalizations are often, if not usually, untrue, and the reason for a person’s decision for how they vote is usually much more nuanced than people on the other side make it out to be. Jesus taught his disciples, “Blessed (literally: “Happy”) are the peacemakers, for they will be called sons of God” (Matthew 5:9). Helping people make peace with God is at the core of what it means to be a follower of Jesus. An “us and them” mentality which divides people over political issues will only hinder that from happening. Furthermore, resentment towards others hinders people from having a relationship with God. 1 John 4:20-21 says: If anyone says, “I love God,” and hates his brother, he is a liar; for he who does not love his brother whom he has seen cannot love God whom he has not seen. And this commandment we have from him: whoever loves God must also love his brother. Yes, even someone who holds different political views than you. We are called to be peacemakers, between God and people and between people and people. Let us not be those who perpetuate divisions, but those who encourage reconciliation. President Obama said to the nation today, “Whether you are a Democrat or a Republican, we are all Americans first.” As Christians, we go one very big step beyond that: We are not Americans first, we are Christians first. As Christians, we have a calling to be ministers of the gospel. Jesus said to his disciples, “Just as the Father sent me, so I also send you.” (John 20:21) When people think of Christians, we don’t want them to associate us with a politician or a political affiliation or party, we want them to associate us with Jesus and the gospel message of the love and grace of God. In a country as divided as ours is right now, it is very possible for politics to become a stumbling block and a hindrance to people being willing to hear the message of the gospel from those they disagree with politically. We can’t allow that. Our mission is so much more important. Christians need to strive to be known not for alignment with a particular party or stances on economic policy or gun rights, but for our concentrated focus on the mission of God and the message of the gospel. This is not to say that Christians should not have opinions on such matters, it is to say that we must not allow these things to be associated with what it means to be a Christian. May God bless our nation and help us who call ourselves Christians to faithfully follow Jesus, communicate his heart and carry out his mission. I was talking to a friend in Romania the other day and he said it feels like he is always seeing Longmont in the news. It’s true. Longmont has made national (and apparently international) headlines a lot in the past few years, and not for good reasons: catastrophic floods, carjackings involving kids, and most recently a fetal abduction in which a woman who was 7 months pregnant responded to a Craigslist ad for free baby clothes was beaten, stabbed and had her baby cut from her womb and kidnapped. For what it’s worth – crime rates in Longmont have actually decreased in the last year, as opposed to Boulder, which has higher crime rates which haven’t decreased, but this kind of stuff, although not characteristic of this fine town, gets a lot of publicity – as it should. The suspect’s arraignment will be today at 1:30, but the Times-Call reported that the DA has already stated that murder will not be among the charges brought against this woman, the reason being that Colorado law does not count the death of an unborn child as murder, unless the child lived outside of the womb for some time. 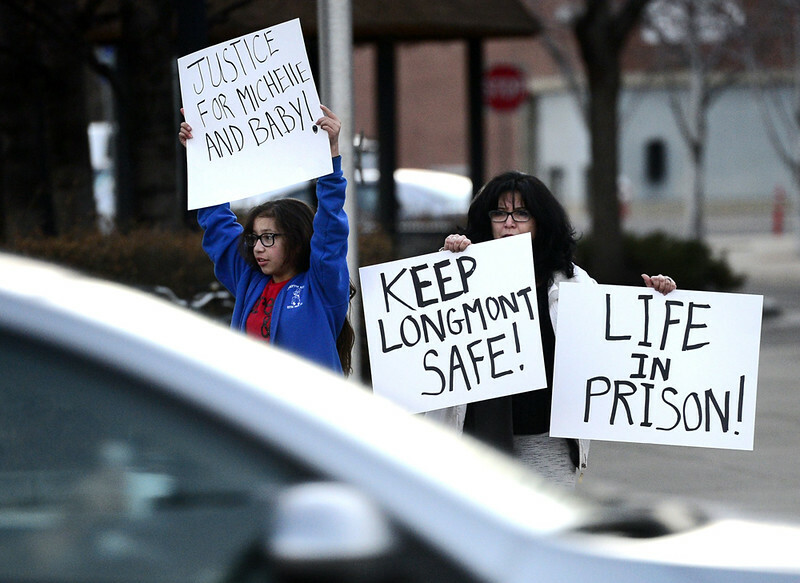 The issue in this case is that it’s not possible to prove that the child lived outside of the womb, and if so, for how long – so Colorado’s wording of the law will not allow a murder charge in this case. People in Longmont were protesting this and picketing on Main Street last week when it was first announced. The charges expected to be brought against the suspect are: suspicion of attempted first-degree murder, first-degree assault and child abuse knowingly and recklessly resulting in death. The problem with those charges are that even all together they will not lead to as strong of a sentence as if murder or manslaughter had been part of it. Since the mother survived, and there is no proof that the baby lived outside of the womb, Colorado law has no way to charge her with anything stronger. What do you think? Is this justice? The sad part of this is that if this attack had not happened, this baby would have lived. The baby’s life was clearly taken by this attack. I find it hard to accept that we have no way to prosecute that. I took the bus today, and I liked it. I’ve always thought about riding the bus here in Longmont; there’s a bus stop about 100 feet from my house. The thing is, that the bus doesn’t run very often, and it costs just as much as driving my car around town. I’d rather get around without my car – but there’s no real incentive to do so, until now. Starting today, busses within Longmont are free. If you ride from Longmont to Boulder, you will be given a voucher to reduce the price for the in-town part of the ride. Unlike my car, the bus is air-conditioned. And even though the ride to where I work on Tuesdays is 30 min by bus, as opposed to 12 min by car – I always have plenty of work I can do on my phone while I am sitting on the bus, which makes it time I can easily spend productively. I’m not sure if this initiative is motivated by the desire to be environmentally friendly or simply because no one was riding the bus (my guess would be the latter), but I say: Good on you, Longmont! I love that this city does cool stuff like this. I will definitely be riding the bus a lot this year and using my car less.